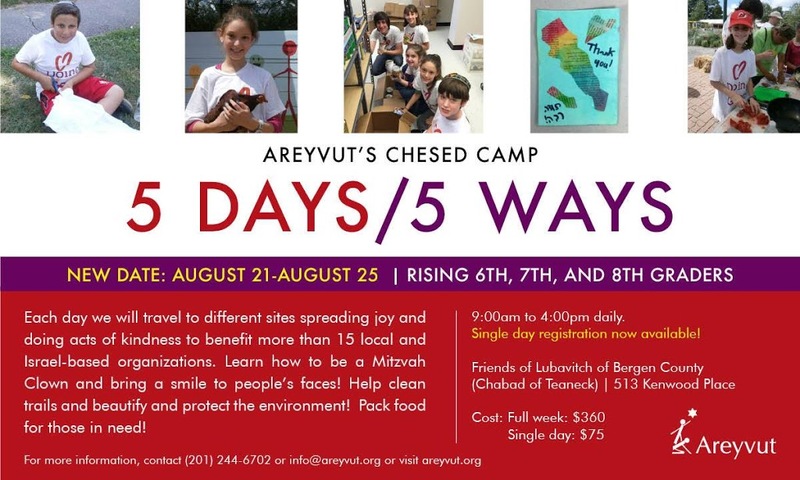 As you may know, 5 Days/5 Ways, our one week Chesed Camp begins this Monday. We provide these FAQ’s to answer common questions. 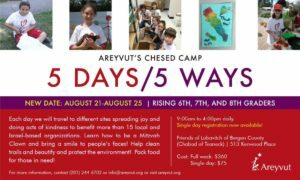 Camp is run by Areyvut and we use Chabad in Teaneck as a base. Camp starts at 9 am and ends at 4 pm. 5 Days/5 Ways is geared for incoming middle school students, that is 6-8 graders and 5th and 9th graders are welcome to participate as well. Alisa Danon Kaplan and Daniel Rothner run 5 Days/5 Ways. Combined Alisa and Daniel have over 45 years of professional experience. Is there any other staff? Throughout the week several high school students will join to help facilitate various aspects of the program. Is camp geared to a particular community? The camp is open to all regardless of geographic locale or religious affiliation. At the outset let us say clearly that money should not be a barrier for participation. We want to engage as many people as possible in this fun and meaningful program. For the whole week it costs $360 and per day it is $75. Registration is ongoing and your child can join throughout the week. The easiest way at this point is to simply e-mail us at info@areyvut.org and let us know your child’s name, the grade they are entering, alert us to any allergies and let us if they are coming the whole week or for a particular day(s). We will also need your and your spouses e-mail address and cell phone numbers. How can I pay for camp? When you bring your child to camp please bring a check made payable to Areyvut and put 5 Days in the memo. This is the tentative 5 Days/5 Ways Schedule and it is subject to change. Can I get community service hours for camp? Absolutely. If you need to complete a form just let us know. Is there a dress code for camp? It is camp and we want everyone to be comfortable. Participants can wear pants, shorts or skirts. If the program requires particular attire we will inform you in advance. This is a reason to register and inform us in advance what day(s) you plan to attend. We will be providing lunch one day and the participants are asked to bring their own lunch the rest of the days. We will be providing water and snacks daily. In addition to a fun and memorable experience every participant will receive t-shirts and a hat. During the week will you be sharing about camp? Yes throughout the week we will be posting and sharing pictures and videos to our social media channels including Facebook, Instagram, LinkedIn, Twitter and YouTube. This is awesome! Can I sponsor so that I can partner in this awesome program? We would love that and checks can be made payable to Areyvut and please put 5 Days in the memo and send it to 147 South Washington Avenue, Bergenfield, NJ 07621. All sponsors and donations are tax deductible. Is it possible for me to come visit camp and see it in action? Sure, we would love that. Since the question is subject to change we suggest that you e-mail info@areyvut.org and tell us when you want to come visit and we will alert you to any changes and will be happy to greet you at camp. Can I get a sense of last year’s program? Sure, watch http://bit.ly/2enROIa to see the video from last year. It will give you a sense of the program and how it impacted the participants. You will also see how much fun they had. If I still have questions who do I contact? Feel free to reach out to us with any questions you still have. You can call us at 201-244-6702 or e-mail us at info@areyvut.org.